Opium or doda, as popularly known in Rajasthan, is largely known for all the wrong reasons. The USHA Silia School team visiting the bordering villages of Pakistan in Western Rajasthan in Bikaner district witnessed the massive ill-effects of opium on healthy human population. Opium is offered and consumed in these villages as a socially sanctioned gesture (when people visit each other’s home on social occasions and otherwise). The prevalence and usage of opium is so rampant that it has resulted in a colossal decline of health of most of the male population in the villages. Bed-ridden opium addict men in the age group of 25 -40 years, is a common sight when you walk through the villages. Since such men cannot contribute to the family income, it becomes imperative for the women to work for a living. However this becomes all the more daunting for the women, as agriculture work in these dry arid areas is difficult and social norms restrict these women from going out of the village. This human interest story is of one such Silai School teacher named Suva Kanwar aged 38 years, in the village called Bhelu Ki Dhani , some 135 kms from the Bikaner district headquarters . Suva has never been to a school and has learnt some basic calculations all by herself. She is married to a person who is an opium addict and from whom she had 3 children. The addiction habit of the husband cost a fortune for the family (Rs 1500/- a month on medicines etc. ) and this was meted out by Suva Kanwar by selling all the land and other assets that they possessed. Her son, aged 10 years, was sent to work as a child labour, in one of the restaurants in district Mathura in the state of UP. Her daughters had to drop out of school in order to help her in the household chores. Hence due to the opium addiction of the husband, the entire family got into a deplorable state of affairs financially, physically and educationally. Suva Kanwar was determined to take her family out of this vicious circle. Hence she wanted to move out of her village to work. But social restrictions prevalent amongst the Rajput communities prevented her from moving out of the village. At one point Suva Kanwar did not have any idea about the road ahead. She could neither move out nor stay in the village. Not until, the organisation called Urmul Seemant Samiti, a partner organisation of Usha International Ltd, implementing the Silai School Program came in contact with her, with a suggestion to her to start the Silai School. 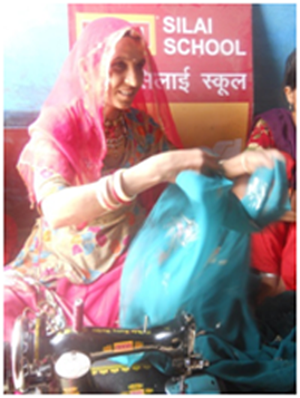 She was identified as one of teachers to run Silai School in her village -Bhelu ki Dhani. The 7 days residential training, held at Bikaner that she attended proved to be a life changing event for Suva Kanwar as this helped her to start a Silai School at her own home. Post training, “armed’ with the Usha Silai School Signage, a syllabus and a new found confidence and hope, Suva Kanwar started to undertake community meetings, door-to-door visits, informing people about the Usha Silai Schools. 2 girls from the neighbouring families enrolled at her school. Word spread far and wide about Suva Kanwar’s Usha Silai School. The signage added to the excitement and curiosity of the people. This was the first time a “resource” had been started in the village after the inauguration of the Govt Primary School or the Primary Health Centre (PHC). The community whole-heartedly supported her initiative and enrolment of women and girls in the Silai School gradually increased and today she is teaching 12 women in her Silai School. About 18 students have successfully completed their courses in this Silai School. When asked about her future plans she says enthusiastically, “I will shift this silai school to the village crossing. In this way, more learners will be able to have access to my school”. The Usha Silai School has stitched joys in her life in more than one ways.